Centre for Training in Judiciary and State Prosecution Service is a independent legal entity, funded by the governmental budget. This is the only national institution dealing with the training and professional education of judges and state prosecutors. Centre can also organize and implement trainings for attorneys-at-law, notaries, bailiffs, advisers, clerks and trainees in courts and state prosecution offices. 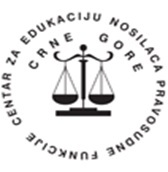 Purpose of the trainings are acquiring and improving knowledge and skills that will ensure independent, autonomous, impartial, expert and efficient discharge of the duties of judges and state prosecutors in line with the principles of independence and autonomy and standards of ethics of their profession. Centre can: organise and implement trainings for trainers and mentors; issue certificates on completed trainings; issue publications; organise a library for training purposes, keep documentation on implemented trainings; and cooperate with other national and international organisations and institutions. Centre is comprised of the Steering Committee and the Programming Council. Centre is managed by the Steering Committee, and Programming Council is an expert body. Steering Committee consists of seven members as follows: a judge of the Supreme Court of Montenegro; a state prosecutor from the State Supreme Prosecution Office; a representative of the Judicial Council; a representative of the Prosecutorial Council; a representative of the Ministry of Justice; a representative appointed among the law professors; and a representative of the Bar Association of Montenegro. Programming Council consists of the Programming Board for the Initial Training and the Programming Board for the In-service Training. Secretariat of the Centre is established as an expert service to perform expert, financial, administrative, IT, analytical and other tasks for the Centre, and is managed by the director.